FISH is Fully Integrated Software and Hardware (btw, as a side note, the internal project at Sun to create appliances based on ZFS was known as FISHWorks). The Raspberry Pi is a cool piece of hardware, but I typically need stuff that is only (or mostly) found on Solaris and derived OSes, such as ZFS. I've been using ZFS for many years now, since the first public release on Solaris Nevada. ZFS scales and give you data integrity. And it can run on the largest systems known to man. For example, I'm listening right now to ZFS Day's live video stream and hearing a talk about ZFS on the Sequoia supercomputer, which is the fastest supercomputer out there. They are using it as a native port, not using FUSE. Wikipedia: "ZFS is a combined file system and logical volume manager designed by Sun Microsystems. The features of ZFS include data integrity verification against data corruption modes, support for high storage capacities, integration of the concepts of filesystem and volume management, snapshots and copy-on-write clones, continuous integrity checking and automatic repair, RAID-Z and native NFSv4 ACLs. ZFS is implemented as open-source software, licensed under the Common Development and Distribution License (CDDL)." So, ZFS scales at the highest level obviously. Well, it also scales down: I've been using a bit ZFS on the Raspberry Pi using FUSE, until I can get a Solaris derived OS ( such as illumos, smartos, openindiana, opensolaris etc) on the Raspberry Pi. That way, at least I have ZFS. Still missing zones, smf and dtrace, but it is a start. I'm using a 240MB split on that Raspberry Pi since it is running only in text mode at the console, and I remote to it using ssh -X.
Wow, it compiled (scons). And installed (sudo scons install). It's a good thing we are using the zfs-fuse-arm version, because the mainline wont go very far on the compile. A demonstration, if you please? fdion@raspberrypi ~/myfilesystem $ cp /etc/*.conf . How cool is that? I now have a mirrored backup of my .conf files. Well, not quite. We are using fake disks, so if the SD card dies I loose all. So next time we'll demo with actual USB drives. Mirroring works fine, and if a device fails, it is handled properly, however zpool status doesn't reflect the reality. I hadn't tested that part yet, so I'll have to dig in the code. Before doing this I was accessing a file in a loop, it is still looping. So the zfs side of things is working, just not the notification to the status. What's the chance that the file data was in the arc cache hence zfs didn't notice the disk vanish. Try a write, that'll force IO to the disk which should cause the failure notification. Alright, we got to get this to trigger. Let's do a scrub. I'm thinking there might be an unimplemented message. I'll have to look at the code when I have a few minutes. It takes a while for zfs to give up on IO to devices - it can be 5 minutes or more before zfs offlines the device. If you generate some IO to the device then wait it should eventually notice the device is gone. Shortening device timeouts will help here. Yes, I do have a freebsd Pi too. My long term goal though is to run IllumOS on the Pi. Hello. I have an external hard drive that is formatted in NTFS file system and I would like to have it in FAT32 so I can use it on my ps3 system. Thing is that the drive is half full with data and my main drive isn't big enough to copy, reformat and copy back. Is there any software that could change the file system without deleting the data from the drive? Thank you for your answer. I was hoping someone had done this when i found this blog... def gonna check that out! When running scons, is this something to worry about ? use VariantDir() and the variant_dir keyword instead. File "/root/zfs/zfs-fuse-arm/src/lib/libzpool/SConscript", line 4, in "
lib/libzpool/vdev.c:1085:3: warning: comparison between pointer and integer [enabled by default]"
Hi, I believe we have native ZFS support in linux now. Did you try it ? 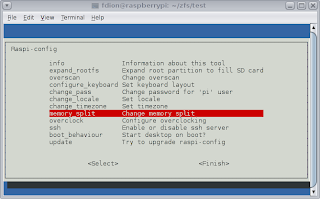 Just seen this blog because I was google-ing Raspberry Pi and ZFS. 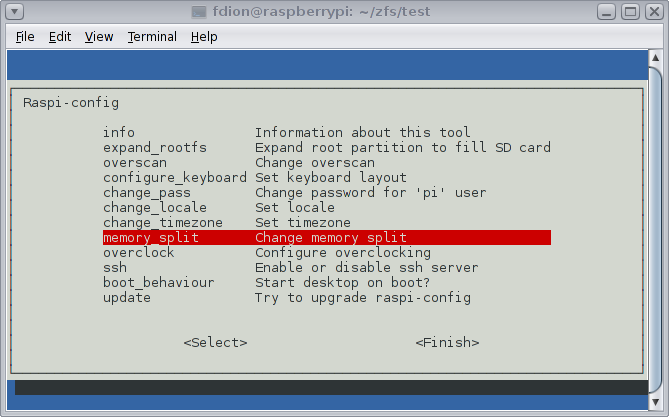 I'm going to give native ZFS a try on a raspberry pi this weekend using Gentoo. My laptop already runs root on ZFS with Gentoo and the ability to jump back to snapshots instantly is a god send when an emerge goes bad. Just got my first R-PI today and cant wait to try it out, I will use my laptop to cross compile over distcc though because I think I could wait a long time for the R-PI to compile just the kernel let alone everything else. Is possible to create only a FS in zfs without mirror? By the way: ZoL compiles for Raspbian just fine. It'll most likely perform better than zfs-fuse thanks to its kernel module, which is pretty important in a pi.